People fleeing violence in Bentiu, the capital of Unity state, South Sudan, arrive at the UNMISS base to seek shelter, April 15, 2014. 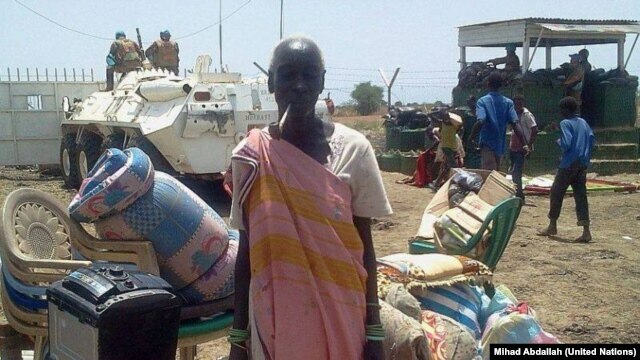 The United Nations Mission in South Sudan (UNMISS) on Monday accused opposition forces in Bentiu of carrying out targeted killings, including of children, and inciting "vengeful sexual violence" against women after they captured the town last week from government troops. 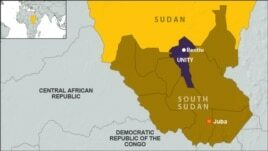 "Several men, women and children believed to be of Nuer ethnicity were killed for hiding (inside Bentiu hospital) and declining to join fellow Nuers who'd gone out to welcome the opposition forces as they came into the town of Bentiu," UNMISS spokesman Joseph Contreras toldandnbsp;South Sudan in Focus. Contreras said members of other South Sudanese communities and Darfuris were also targeted and killed at the hospital. "And that same day, opposition forces entered a mosque where civilians had taken shelter, separated individuals gathered there on the basis of nationality and ethnic group, and then escorted some to safety and killed others," he said. More than 200 civilians were killed at the Muslim place of worship, Contreras said. Opposition forces entered a mosque where civilians had taken shelter, separated individuals gathered there on the basis of nationality and ethnic group, and then escorted some to safety and killed others. UNMISS also said that individuals associated with the opposition have been using an FM station in Bentiu to broadcast hate speech. "While some SPLA in Opposition commanders did broadcast messages calling for unity and an end to tribalism, others broadcast hate messages declaring that certain ethnic groups should not stay in Bentiu and even calling on men from one community to commit vengeful sexual violence against women from another community," UNMISS said in a statement. A spokesman for the opposition, James Gadet, denied the UNMISS accusations. "This is not true. Our forces did not target any civilians," he told VOA. "Some of the people that got killed, who happened to be Sudanese nationals, were members of the Justice and Equality Movement" rebel group, who were fighting as mercenaries for the government of South Sudanese President Salva Kiir,andnbsp; Gadet said. He denied that rebel forces were singling out people based on their nationality or ethnicity. "What they were doing is to make sure the town was clear,andnbsp; looking maybe for remnants of government troops. They were not looking for civilians," he said. "I'm not aware of this. What they were telling the civilian population is to remain calm... there was no hate message," he said. Opposition forces recaptured Bentiu, the capital of one of South Sudan's oil-producing states, last week from government troops. The number of civilians seeking protection at the U.N. base in Bentiu has risen sharply since fighting for control of the cityandnbsp;erupted around two weeks ago. The number grew from around 7,000 before the fighting to around 22,000 on Monday, Contreras said. "Even before the attack on Bentiu that resulted in the capture by opposition forces... our base in Bentiu was receiving a steady influx of unarmed civilians who had been displaced by hostilities and fighting in various parts" of Unity state, he said. At the start of April, the base housed some 4,000 internally displaced South Sudanese, Contreras said. Unity is one of two states in South Sudan that produce oil, the backbone of the country's economy. Much of the fighting that continues to rake the young country has been centered in Unity and the other oil-producing state, Upper Nile. 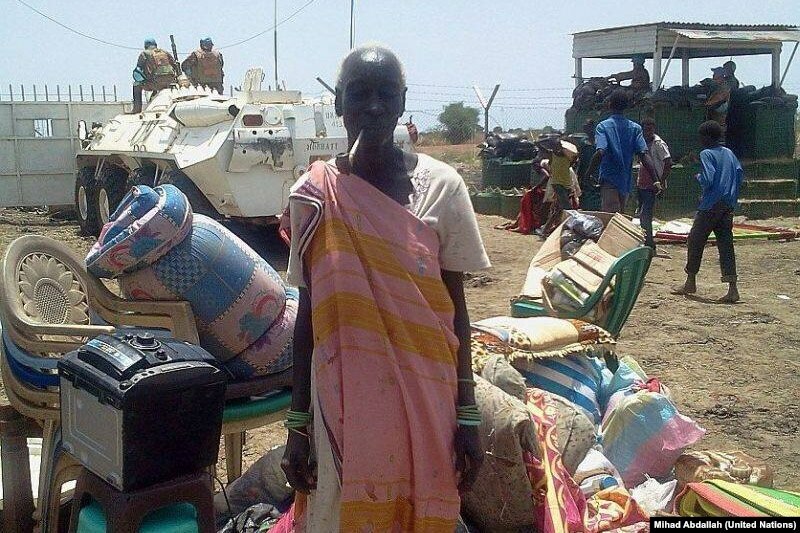 The largest state in South Sudan, Jonglei, which is sandwiched between the two oil states, has also seen heavy clashes. In just over four months of fighting in South Sudan, more than a million people have been forced from their homes. Around 100,000 have sought shelter inside U.N. bases and compounds, nearly 300,000 have fled to neighboring countries and more than 700,000 are internally displaced. No death toll has been established for the fighting in the young country, but thousands are believed to have been killed. Updates with rebel spokesman reactions. All interviews conducted by phone from Washington, D.C. by John Tanza.